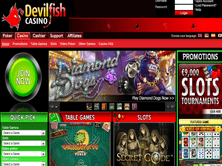 Devilfish Casino is an online gaming and betting site owned and established by Entraction Operation Ltd. Casinos in 2007. This site features a variety of online casino games in their darkly themed site interface which also features Dave Ulliott, a renowned poker player who is also known as "devil fish." It is duly registered and licensed by the government of Malta under the operation of IGT Interactive Operation Ltd. The gaming site is currently powered and developed by two software providers, Net Entertainment and World Match. These providers supply the online site with a wide variety of virtual and interactive table games, video pokers, classic and video slot machines, roulettes, bingo games, arcade, and other specialty games. Devilfish currently gives focus on its classic and video slot games. Some of these famous classic slotmachine game titles include Mega Joker, Pirate's Gold, Jackpot 6000, Gold Rush, and Safari Madness. The site's video slots selections include game titles like Gonzo's Quest, Jack Hammer, Boom, Piggy Riches, and Brothers Secret Code. Some of these games offers great bonuses and rewards to its players - which range from free spins, multipliers, and bonus games. Another crowd-enticer are the site's progressive jackpot games which include game titles such as Geisha Wonders, Fishy Fortune, Super Lucky Frog, Vault Assault, Icy Wonders, and Cash Bomb. 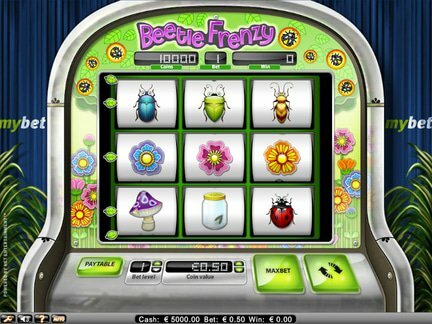 These games attract more players because of their huge jackpot amounts. Other classic casino games in the site are its collection of table games such as Oasis Poker, Let It Ride, Baccarat, Blackjack, Roulette, Pontoon, Punto Banco, Red Dog, Bingo, Golden Derby, Keno, Triple Wins, TXS Hold'Em, and many more. Players may also enjoy the site's video poker games which include Deuces Wild, Joker Poker, Jacks or Better, and Joker Wild. However, Devilfish only provides its players with a limited selection of promotions and incentives. These include weekday casino tournaments where players have the chance to win large amounts of prizes, as well as gaming tournaments wherein regular players can win up to €9,000 weekly. The gaming site also offers exclusive VIP privileges and bonuses to its regular players. Despite all of these positive site features, several review sites have reported that the company has been closed down and is no longer available for gaming and betting. This report somehow brought confusion and raised some issues on the site's irregularities and security on its players' accounts. Thus, Devilfish gets a fair 3 out of 5 rating for its efforts to bring an innovative and interactive gaming experience to its players.